Check out the new trailer for the paranormal thriller Red Lights (embedded below) which pits Sigourney Weaver as a scientist and paranormal investigator as she takes on Robert DeNiro. Veteran paranormal researchers Dr. Margaret Matheson (Sigourney Weaver) and Tom Buckley (Cillian Murphy) debunk fraudulent claims of ghost whispering, faith healing and other psychic phenomena by detecting what Matheson calls “red lights,” the subtle tricks behind every staged supernatural occurrence. 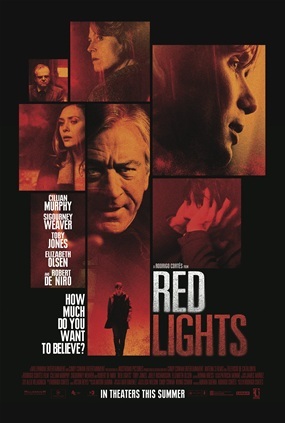 But when the legendary blind psychic Simon Silver (Robert De Niro)comes out of retirement after 30 years, his once-fearless adversary Matheson warns Buckley to back off, fearing reprisal from the powerful Silver. Determined to discredit Silver, Buckley and his star student (Elizabeth Olsen) use every tool at their disposal to uncover the truth behind the charismatic, spoon-bending, mind reader. But Buckley is forced to reexamine his own core beliefs as his quest builds to a mind-blowing conclusion in this taut psychological thriller from award-winning writer and director Rodrigo Cortés (Buried). The unofficial Paranormal Pop Culture synopsis: Erstwhile Ghost Busters client Dana Barrett does battle against Louis Cyphre! The film has also released a clever little interactive video to promote the movie where Weaver discusses red lights and unexplained phenomena (also embedded below).